Interdisciplinary multi-performances (including me as a butcher and assembling sculptures), installation, dance, electronic sound design, and costume design (directing two visual performers, two sound designers, six dancers, one fashion designer, and six staff for the documentation and the set design). The project was shown in the Master of Fine Arts Exhibition of the Department of Art in the Urban Art Space Gallery of The Ohio State University during the opening reception on Saturday, May 8th, 2010. The project created choreographed relationships between the artificial floating sculptural works, natural animal organ-industrial materials hybrids, and a group of dancers’ gestures, all the while manipulating Merce Cunningham's Rainforest  and remixing David Tudor's music, Rainforest . John Cage, Gordon Mumma, and Nam June Paik’s music were also remixed in some parts of the performance. Pig Bladders-clouds in Rainforest was an interdisciplinary performance project and applied the expanded art form of the Organ-machine Hybrid project series. Many collaborators including visual artists, dancers, and sound designers modified Cunningham’s and Tudor’s Rainforest, respectively. Everyone’s work came together and explored improvisations during their performances and changed the choreography, sounds, music, visual environment, and other situations, creating an homage to Cunningham’s Rainforest. The visual artists created and installed the bladder sculptures, the dancers performed interactive choreography with the flying bladders, and the sound designers manipulated original music and added noise performed in various categories - all at the same time and in the same place. The dancer’s choreography illustrated gestures of animals, machines, and animal-machine hybrids. The male dancer’s robotic gestures and female dancers’ repetitive machine-like gestures reflect the stilted, yet oddly natural-looking movements of animal-machine hybrids. In the musicians’ music, they manipulated animal sounds translated into robotic sounds. The dancer’s costumes illustrate human-animal-machine hybrids’ figures through adding electronic materials such as LEDs and a propeller. Each of dancers had a different fabric pattern with different color, which symbolized the existence of different species. 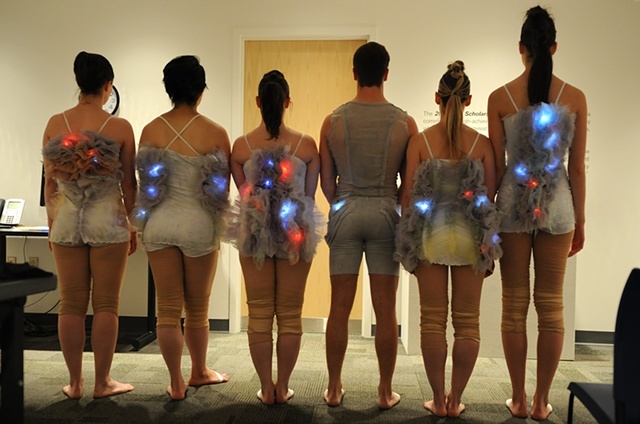 The dancers’ costumes featured electronic LEDs, just like the bladders’ blinking LEDs, to signify the relationship between the natural living things and the sculptures. The electronic LEDs on the dancers’ costumes and the electronic propellers on the male dancer also represent the Posthuman enhancement of the body.